A gentleman’s agreement has ruled James Dunne out of a Pompey reunion. The combative midfielder has been a regular for Cambridge United following his January switch from the Blues. Shaun Derry’s side are scheduled to visit Fratton Park on Saturday – yet Dunne will not be involved. Instead the 26-year-old will watch from the sidelines under the terms of his transfer from Pompey. The U’s will honour an agreement with their League Two counterparts which requests Dunne does not face his former club in the encounter. 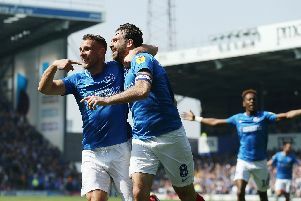 Dunne made 30 appearances for Pompey, scoring once.